The likelihood that you or a family member will be in a car accident and suffer serious injuries or die increases when you are driving at night. According to the National Safety Council, the risk of a fatality is three times greater than during the day. This is true even though there are fewer vehicles on the road at night. You do have legal options if you were hurt in nighttime car accident. You may be able to hold the negligent driver accountable for compensating you for your injuries. What Are the Causes of Nighttime Vehicle Crashes? Poor vision. Much of our ability to quickly react to situations on the road depends on our vision. Depth perception, color recognition, and peripheral vision are reduced for many people at night. The glare of headlights can also make it more challenging to see what is on the road. Seniors and people who wear corrective lens or are visually impaired have even more difficulty seeing when driving at night. The most dangerous time is at dusk because the eyes must constantly adjust between light and dark. Fatigue. Studies have shown that driving drowsy can have the same harmful effects on a person’s driving abilities as when driving while intoxicated. People are more likely to be drowsy or fall asleep at the wheel at night, especially during late nighttime hours. Truck drivers, night shift workers, and people who suffer with sleep problems are most at risk of causing an accident when driving at night. Rush hour. Evening rush hour driving—between 4:00 pm and 7:00 pm—can be dangerous due to road congestion and impatient drivers in a hurry to get home from work. This is especially true on our Atlanta-area roads and highways. When it is dusk or dark in the winter months, this can increase the chances that a negligent driver will cause a wreck. Impaired driving. According to the Centers for Disease Control and Prevention (CDC), 28 people are killed in accidents involving an alcohol-impaired driver every day in our country. Using alcohol or drugs before driving significantly reduces a person’s reaction time, decision making, and other driving skills. More drivers who are intoxicated are often on the roads during the nighttime hours. Speeding. 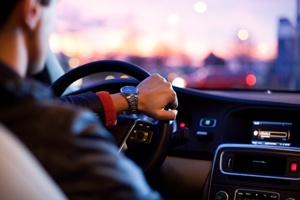 Speeding is never safe, but it is more dangerous when done at nighttime when vision is reduced and other drivers may be having a hard time seeing as well. Deer. During October through part of December, deer tend to be more active, especially in the early evening hours. They can travel in herds, act unpredictably, and be blinded by driver’s headlights—all contributing to a deadly accident. Be certain that your headlights are aimed properly to avoid blinding other drivers. Keep your headlights, windows, signal lights, and taillights clean. Do not drink alcohol or consume drugs before driving. When vehicles are approaching, focus on the white line that marks the edge of the road rather than the oncoming headlights. Avoid speeding and keep more distance between your vehicle and those around you. If you are tired or falling asleep while driving, pull over and take a rest before continuing to your destination. Even if you follow these safety tips, a negligent driver could cause you or a family member to suffer injuries or die in a nighttime auto accidents. Let the experienced car accident attorneys at Chris Hudson & Associates, help you obtain the compensation you deserve. Contact us online or call us directly at 888.795.6261 to schedule your free, no-obligation consultation.